So here he is, Big Jack, still doing it after all these years, sitting down for another Masters preview story. It's not like he needs it. He's been playing his part in these write-ups since 1959, when his hometown afternoon daily, The Columbus Dispatch, sent him off to Augusta, 19 and chaperoned by his father, with a story. Maybe Charlie Nicklaus brought the inaugural issue of GOLF with him (April 1959), with its tip about how to turn your 4-wood into a 5-wood. (Choke up.) He surely could not have expected that his boy would someday win six club coats, join Augusta National as a member and become a casual mentor to a new generation of prodigy golfers at work in its fields. Big Jack. It's no wonder we beat a path to his door this time of year. I settled in and opened with this handsome keeper: "Did you know you played in 163 competitive rounds at the Masters?" It was a Tuesday at three in the dead of winter, in Nicklaus's modest office on U.S. Highway 1 in South Florida. Nicklaus, now 78, doesn't play much golf anymore, but he had played that day. If that brought him pleasure at all, I couldn't say. "Good to know," said Nicklaus, a semi-polite dismissal of a number that I suddenly realized meant nothing to him. 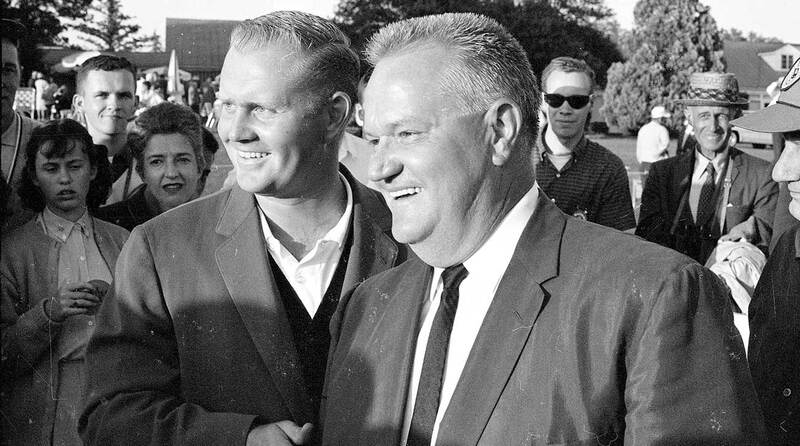 More ignobly, as Nicklaus quickly surmised, my grand total failed to include his winning 18-hole playoff round in 1966. His mind—always his greatest asset—surely had more relevant things on it. Nicklaus was on the verge of announcing a reduced role in his day-to-day management of The Nicklaus Companies, which he owns alongside the new owner of GOLF magazine and GOLF.com, Howard Milstein. He had several important calls on his afternoon docket. The Honda tournament was coming up, which raises money for the Nicklaus Children's Health Care Foundation. Plus, his wife (of 57 years), his five children, his 22 grandchildren. Jack is all here-and-now, here-and-now. And there I was, sitting across from him, a human rewind machine. I asked Nicklaus about Fred Ridley, the new Augusta National chairman. They played together in the first round of the 1976 Masters. "I thought he was a nice player," Nicklaus said. "He knew he was an amateur, not somebody who was going to dominate the game. He wasn't a strong guy, physically. But he was a good player." A pause. "He'd been working with Jack Grout." Okay—a breakthrough! Jack Grout of Scioto Country Club was Jack's teacher, and he had worked with Ridley. Nicklaus was connecting dots, and not for his own amusement. Our subject turned to the players who have come to him for Augusta tutorials. Charl Schwartzel and Trevor Immelman, to name two who took their lessons to Butler Cabin. Various others. Nicklaus was in Florida, but he was heading for the Georgia line. Scott Tolley, a Nicklaus lieutenant and the company's longtime PR man, was helping me keep Jack on the main highway. That is, the road I needed Nicklaus on. "My spiel about Augusta is that there are, to me, about five tough shots there. The rest of the course is not all that hard," Nicklaus said. "You have to get by the tee shot on two. The tee shot on 11. The tee shot and the second shot on 13. The tee shot on 15. You have to watch those shots. The rest of the shots are not that hard to play." Now he was making two distinct nods, one to then (how he did it), one to now (the way they should). Have you noticed in your life that the smartest people can take a complex thing—like playing Augusta National in the Masters—and make it sound simple? I asked Nicklaus what role intelligence plays in winning at Augusta. "I don't think intelligence is all that important," he said. "Discipline is the most important thing. What you have to be is smart enough to know you need discipline." A call came in and Nicklaus consulted with a doctor, a stem-cell specialist. He speaks the language of medicine like a third-year resident. I knew, from previous visits, how Jack had tried to point Arnold Palmer to various medical experts, never successfully. Jack said, "I took Arnold's advice on a lot of things, but Arnold was not a good person to take advice. He was the most stubborn man who ever walked the earth. Nice guy, but stubborn. "I tried to help him with his golf game a hundred times. He got so far away from the ball there was no way he could hit it from where he was standing. Gary [Player] and I would say, 'We're trying to help you, Arnold. Let's go to the range for ten minutes.' Never. He was going to play the way his dad taught him. "Everything Arnold and I did was a competition. In '59, in my first Masters, I hit 31 greens in 36 holes, shot 150 and was out of the tournament. Arnold hit 19 greens, shot 141 and was leading the tournament. I said to myself, 'I better learn how to putt these greens.' I wasn't paying attention to Art Wall. I was paying attention to Arnold. "The '75 Masters was the last time Arnold was really competitive. In the third round, we spent the whole day trying to beat each other. We weren't bothering with the tournament. He shot 75 and shot himself out of the tournament. I shot 73 and almost shot myself out of the tournament. I came back and won. We got done with the round and looked at each other and said, 'We did it again.' I said, 'Can you believe we're so stupid that we want to beat each other so bad that we forget that we're playing in the tournament?'" Against his own natural impulse, he was drifting deeper into then. Nicklaus took a call from an American embassy official in Korea. I excused myself. I don't know what they talked about. I do know Jack's namesake grandson, Jack III, a square-jawed young man working in the family business, was about to head off to the Winter Olympics there. But it could have been something else. The Jack Nicklaus Golf Club in Incheon, site of the 2015 Presidents Cup, is at the epicenter of Korean golf. The call ended and we resumed. Nicklaus had mentioned Arnold's father, and now I was asking him about his own. "Bob Jones was born in 1902 and my father was born in 1913," Jack said. "When Jones won the 1926 U.S. Open at Scioto, my father was there. He was always a fan. "When I got to Augusta in '59, there was a note for my father and me, inviting us to come down and see Mr. Jones. Every year after that, when I got to Augusta, my dad would say, 'Is the note there?' It was, every year." Nicklaus saw Jones age as his rare spinal disease worsened, the whole sad progression from canes to crutches, then a walker, finally a wheelchair. His mind was unaffected. Charlie Nicklaus died in 1970 and Bobby Jones died the next year. Can you imagine what that must have been like for Charlie Nicklaus, to get to know—really know—your boyhood hero through your own son? If you know anything about Nicklaus, you know every detail of his Memorial tournament is important to him, and the Masters is a model for him in all of that. If you're going to be the host of a PGA Tour event, you have to have a relationship with the Tour commissioner, who is now Jay Monahan. Of course, if you're the commissioner of the PGA Tour, you better have a relationship with Jack Nicklaus. When Monahan called Jack, I excused myself again. When I returned, I asked Nicklaus if the new date for the PGA Championship, in late May starting next year, could interfere with the Memorial, played in early June. Nicklaus said he was not worried at all, and that they would never be back-to-back. Still, his preference would be to see the PGA played all over the calendar, and all over the country. A lot of Jack's ideas are like that, outside the box. Muirfield Village, where the Memorial is played, takes its name from Muirfield in Scotland, where Nicklaus won the 1966 British Open. I asked Jack about the Old Course-Augusta connection. "Augusta National is St. Andrews," Jack said. He brought up Ridley's predecessor, Billy Payne. "I told Billy once that when Jones and MacKenzie were designing the course, the Old Course was their whole philosophy. He said, 'I've never heard that.' I said, 'Billy—look at the golf course! You have the whole world to drive it in. Same as St. Andrews. If you put it on the proper side of the fairway, you have the proper approach to the green. Same as St. Andrews. That was Jones's whole approach to the game. Before you go changing this golf course, you better think about what Bob Jones is saying this course is. Augusta is a dead copy of St. Andrews.'" Before long, Nicklaus was talking about the distances today's players hit the ball and how it has changed elemental, strategic things about the course. He talked about building a new tee here and a new tee there, but Nicklaus doesn't really want to see a longer course. He wants to see a shorter ball. He's been talking about that since 1977. "Fix the golf ball," he said. "The golf ball is ridiculous. "Augusta could tell you to play their golf ball and you'd play. But I think Augusta wouldn't do that, because Augusta doesn't want to be above the game. The USGA is our rules-making organization." Tiger Woods, lately, has been talking about the ball, too. I asked Nicklaus about Tiger's major prospects. "His best chances would be at Augusta, followed by the British Open, if he stays healthy. Augusta has all the room in the world to hit it. When he doesn't, he knows how to get out of trouble. He could win any tournament. He's a phenomenal golfer and a phenomenal athlete. Whether he can solve the problem between his ears, which I think is where his biggest problem will be, that's to be seen. He's fully capable of winning two more majors—if he stays healthy. Winning five more is another question." In our then-and-now continuum, we were moving back to now. I had probably lost my chance to ask him anything more from the old days. Nicklaus said he would be playing with Peyton Manning in an upcoming member-member event at Augusta National called The Jamboree. He was in the now. I asked Jack what advice he would give Rory McIlroy, who needs a Masters win to complete the career Grand Slam. "Go live there for a couple weeks before the tournament," Jack said. "Block out the rest of the world. Go play it and play it and play it until you're totally comfortable with it." He mentioned that he was 24 when he first completed the career Grand Slam. He wondered how old Rory is now. Jack asked me to hand him a tall blue cylinder on a nearby table. "Alexa? How old is Rory McIlroy, golfer?" Jack asked it. "This might answer your question: Rory was released two years and 11 months ago. Did that answer your question?" Nicklaus tried three times in all. Scott Tolley gave it a crack. Jack's longtime assistant, Rose Garrido, had had enough. Calling out from next door, she said, "He's 28. He'll turn 29 on May 4." Jack said to his gizmo, "Alexa, play Sinatra, please." Some people are just well-mannered. An old Sinatra hit started to play out of Jack's new toy. Let's grab a kayak to Quincy or Nyack. Jack was having a good time now. Scott Tolley asked, "Alexa, who is the greatest golfer in history?" "My favorite is definitely Jack Nicklaus," the cylinder said. Let's leave our hut, dear. Get out of our rut, dear. The music felt like closing credits. Jack said, "I hope you got what you needed." It was past six p.m. I left. Jack stayed.